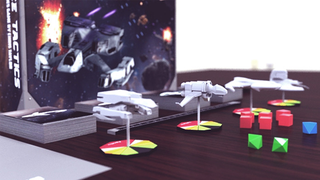 Crowdfund An Official Freespace Board Game, Coding For Kids And More! Man, remember Freespace? Well the hit sci-fi game is back in boardgame form, in a gaming-themed look at the week's coolest crowdfunders. Coding for kids, superhero card games, and Medieval decision making, oh my! The throne room is where you, as King, make the pronouncements that determine the fate of your subjects. Don't think that it's an easy job, however; a queue of people will form each day, desiring an audience with the King, and it's impossible to keep everyone happy. The throne room will reflect actions performed on the map. Take away too much food from a village, for example, and soon after you are sure to encounter peasants complaining about it in the throne room. Reigning from your castle, you only know what your subjects tell you. Which of them are truly needy? Which bring good advice, and worthwhile deals? Who have you managed to keep loyal? We believe Yes, Your Grace offers players a realistic glimpse at the experience of a medieval ruler. Just £8 (around $12) gets you a copy of the game to download, while higher tiers offer things like beta access and a copy of the soundtrack. Emergents: Genesis is a new PvP, multiplayer deckbuilding game where players take on the role of powerful superheroes—known in this world as Emergents—and battle against the other players in the game to be the last person standing. Players customize their decks based on four classes of superpowers in a fast-paced game that can be played by two to four players. Designed by Urban Island Games and Top8Magic, Emergents: Genesis introduces innovative, interactive mechanics to the deckbuilding game that will appeal to all fans of both the superhero genre and interactive card games. $12 can get you a downloadable PDF of the game's rules and cards to make your own, but $39 gets you the physical edition of the game, shipped anywhere in the US. It's never too early to start learning languages. If you want your kids to learn to code, the best time to start is when they're little. Bitsbox is designed for kids as young as seven years old, though we've seen five-year-olds get the hang of it with help from their parents. Writing real code is awesome. We love block-based tools like Scratch—they're great for learning programming concepts and computational thinking. But eventually, there's typing to be done, and it turns out that kids think it's fun and grown-up to use the keyboard. Bitsbox won't start shipping subscriptions until April of next year, but a hefty $150 gets you a three month long program that ships new kits and lessons to the person of your choice. $45 gets you the core game, with the rules, 4 models and all the counters/tokens you need - while higher tiers net you extra miniatures and expansions to the base game.